IJF President Mr. Marius VIZER will hold a live Twitter Q&A session on Sunday evening, his first of the year, immediately following the conclusion of the competition in Paris. Submit your question to the IJF President by using the hashtag #AskVizer on Twitter. Rio 2016 Olympic bronze medallist KONDO Ami (JPN) won her sixth Grand Slam title and her first in Paris as she dispatched World Judo Masters winner Distria KRASNIQI (KOS) with a sumptuous ko-uchi-gari for ippon. Japan won the first final of the competition after KONDO showed her worth and took a major step towards selection for the 2019 World Championships in Tokyo. 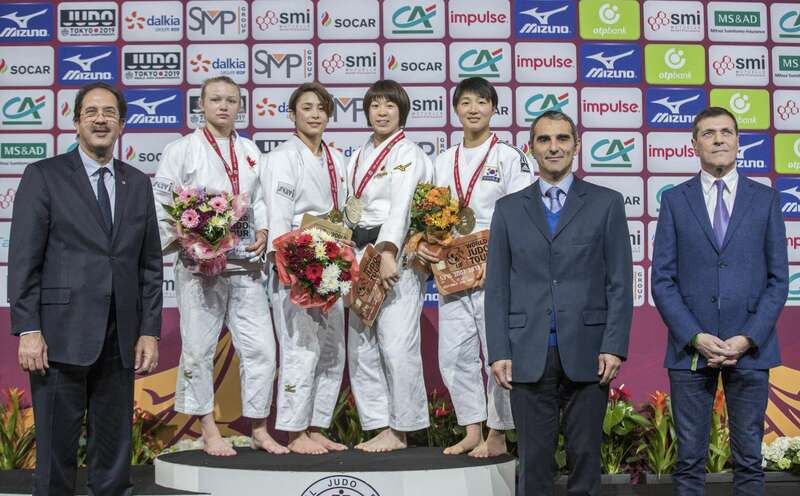 In the first semi-final KONDO held down Ekaterinburg Grand Slam bronze medallist GANBAATAR Narantsetseg (MGL) for ippon while in the second semi-final KRASNIQI defeated world number 14 Melanie CLEMENT (FRA) by a waza-ari score in golden score. The first bronze medal contest saw Sofia European Open winner Melodie VAUGARNY (FRA) beat CLEMENT by ippon from a tai-toshi after 26 seconds. 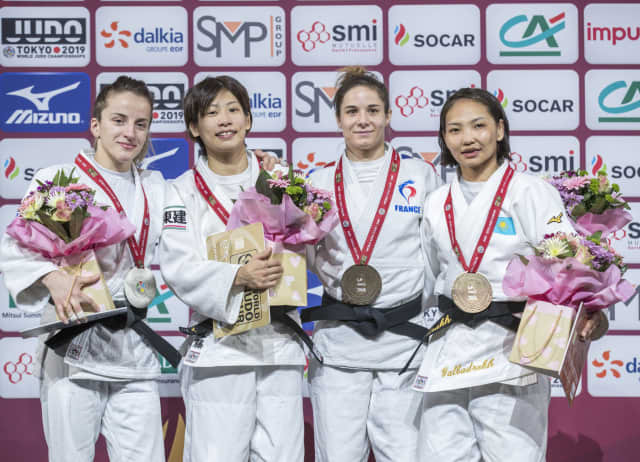 The second bronze medal contest opposed world bronze medallist Otgontsetseg GALBADRAKH (KAZ) and GANBAATAR and it was the former who prevailed after her Mongolian rival was disqualified after picking up three penalties. 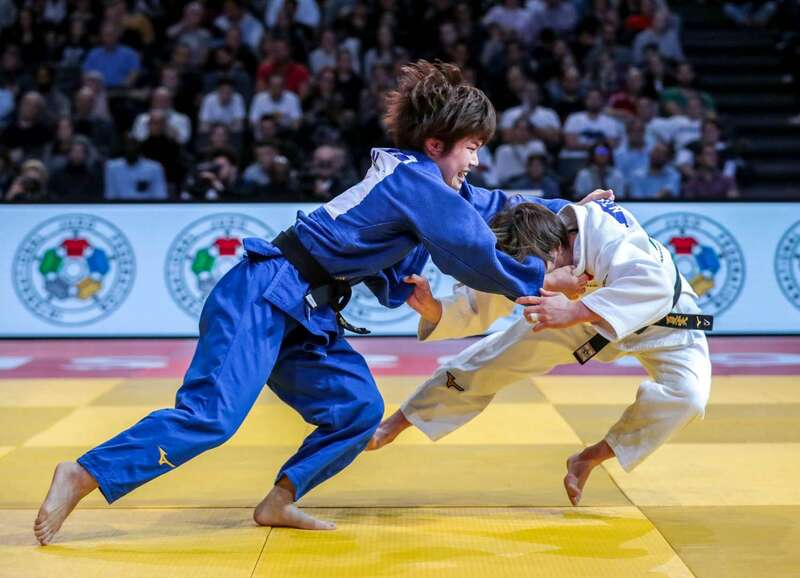 Former world champion SHISHIME Ai (JPN) defeated World Judo Masters gold medallist TSUNODA Natsumi (JPN) to win her third Grand Slam title. SHISHIME recorded a crucial win over her teammate to push herself in front of TSUNODA in the domestic pecking order as both aim to topple world champion ABE Uta (JPN) in the race for Tokyo 2020. A third shido for TSUNODA for passivity gave the victory to SHISHIME who still has a fair chance of selection for the Tokyo 2019 World Championships. In the first semi-final TSUNODA beat Junior European Championships bronze medallist Nina Estefania ESTEO LINNE (ESP) by ippon. In the second semi-final Osaka Grand Slam silver medallist MUNKHBAT Urantsetseg (MGL) was caught with an o-uchi-gari for ippon by SHISHIME. 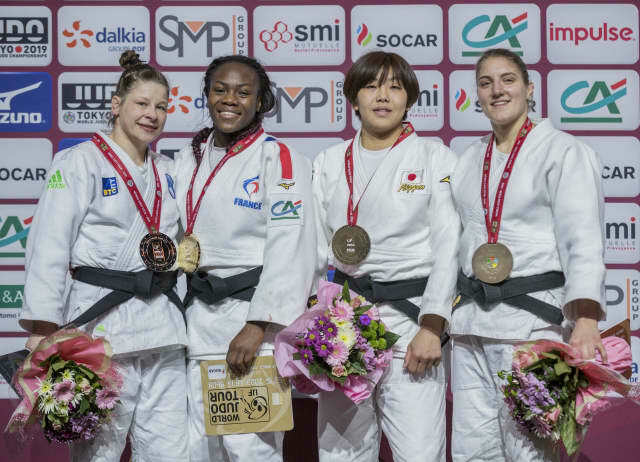 The first bronze medal contest opposed The Hague Grand Prix bronze medallist Astride GNETO (FRA) and -48kg mainstay MUNKHBAT and the home judoka was awarded the win after her Mongolian foe was reprimanded on three separate occasions to receive hansoku-make. In the second bronze medal contest Olympic silver medallist Odette GIUFFRIDA (ITA) bested ESTEO LINNE with a calculated ashi-waza attack which earned a second and match-winning waza-ari for the Italian. World bronze medallist Christa DEGUCHI (CAN) successfully defended her Paris title with a win over teammate and World Judo Masters bronze medallist Jessica KLIMKAIT (CAN) in the -57kg final. The duo are locked in a battle for Canada’s one potential spot at the Olympics next year with both ranked well inside the world’s top 10 on the IJF ranking list. 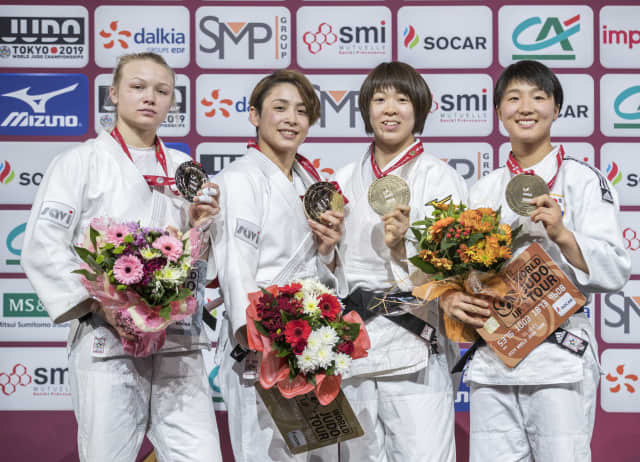 DEGUCHI extended her one-sided record against KLIMKAIT to 4-0 as the world number seven narrowly beat the world number five by a waza-ari score from a last-ditch o-soto-gari with five seconds left in the contest. 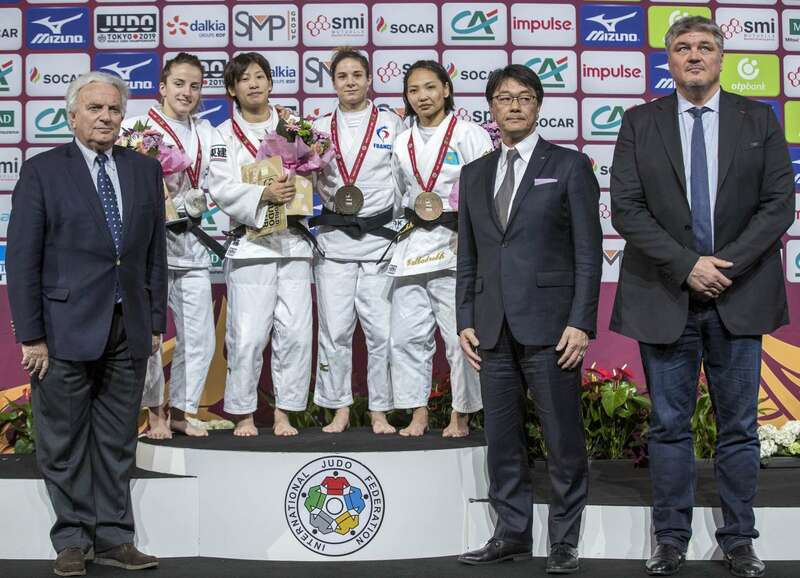 In the first semi-final 2018 Paris Grand Slam bronze medallist KIM Jisu (KOR) was pinned down by DEGUCHI for 20 seconds. 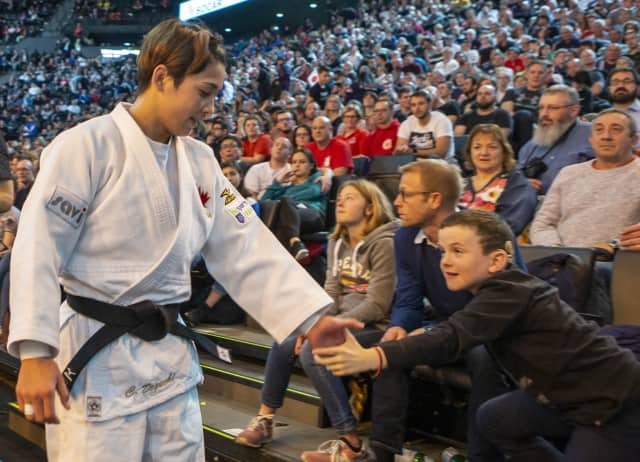 In the second semi-final KLIMKAIT beat Düsseldorf Grand Slam bronze medallist LKHAGVATOGOO Enkhriilen (MGL) who picked up her third shido in golden score. The first bronze medal was won by World Judo Masters bronze medallist TAMAOKI Momo (JPN) who thwarted LKHAGVATOGOO inside the opening minute with osaekomi for 20 seconds and her fifth Grand Slam medal. 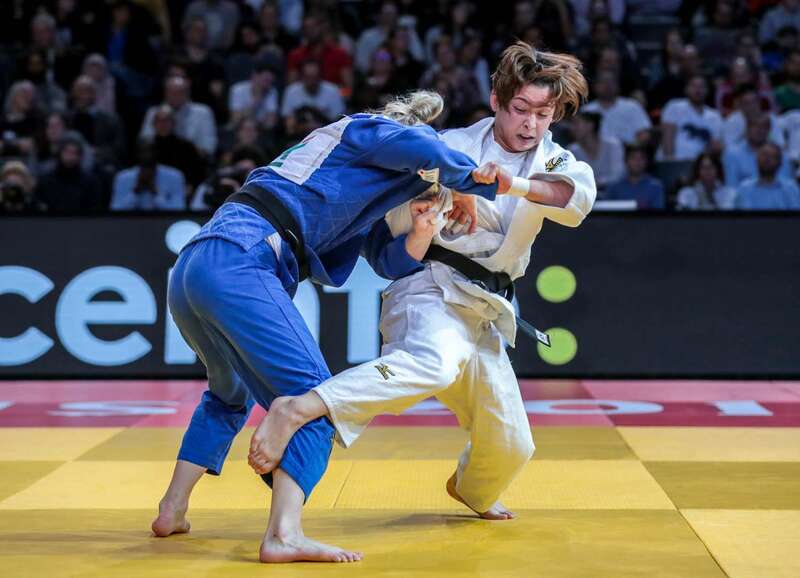 The second bronze medal was won by KIM who unceremoniously sent Olympic champion Rafaela SILVA (BRA) over flat onto her back with a o-uchi-gari after one minute of golden score. 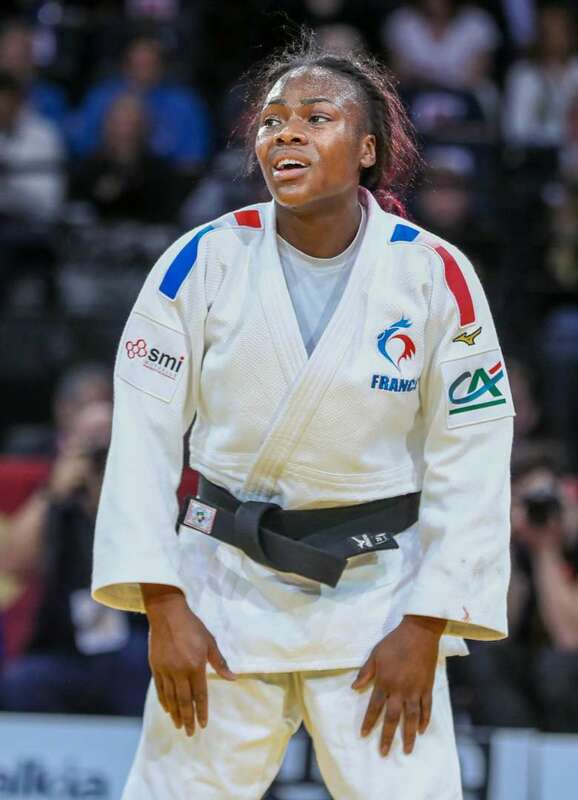 World champion Clarisse AGBEGNENOU (FRA) wrote the latest chapter in the biggest rivalry in women’s judo as the French superstar defeated arch-rival, Olympic champion and two-time Paris winner Tina TRSTENJAK (SLO) to win her home Grand Slam for the fifth time. The rematch of the Rio 2016 Olympic final closed out a thrilling first day of competition in style as both champions gave their all in Paris. Gutsy Slovenian TRSTENJAK more than matched powerhouse AGBEGNENOU in regulation time and for three minutes of golden score until the three-time world champion and owner of the red backpatch rolled over the owner of the gold backpatch for a waza-ari score and France’s first gold medal at home this weekend. 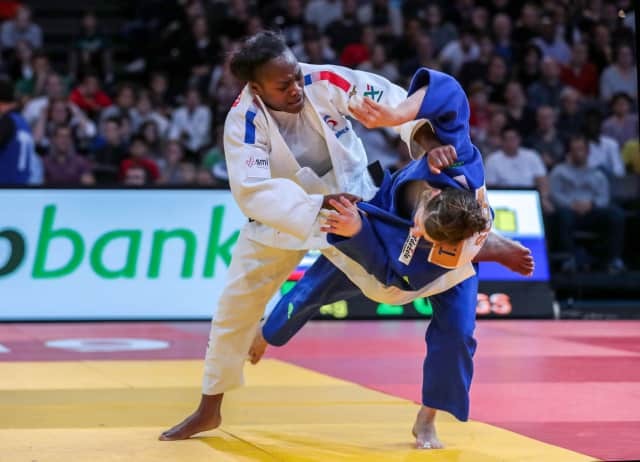 In the first semi-final AGBEGNENOU defeated Tashkent Grand Prix bronze medallist Andreja LESKI (SLO) by two waza-ari scores to comfortably advance to the final. 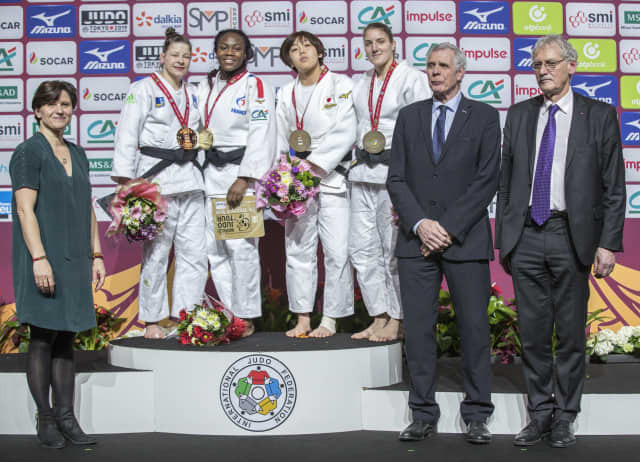 In the second semi-final TRSTENJAK outlasted World Judo Masters silver medallist NABEKURA Nami (JPN) who was disqualified after receiving her third shido for passivity. 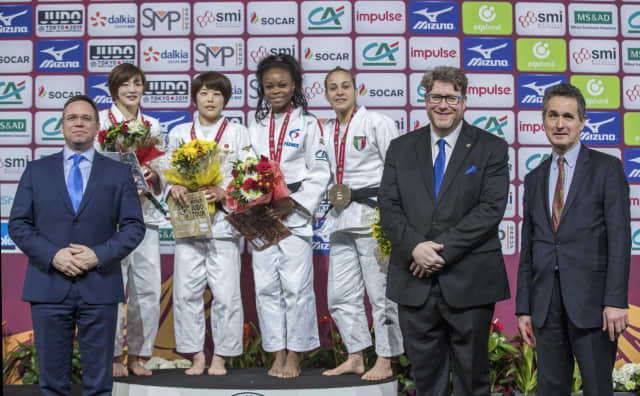 In the first bronze medal contest NABEKURA dismissed Cancun Grand Prix silver medallist Catherine BEAUCHEMIN-PINARD (CAN) after just 29 seconds by ippon from an o-soto-gari. 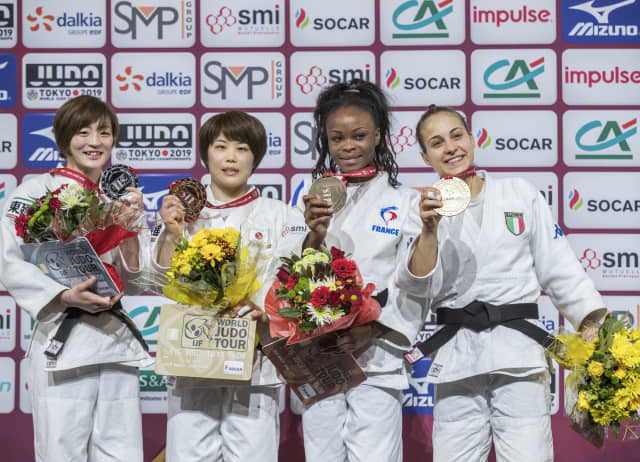 The second bronze medal contest saw LESKI conquer Osaka Grand Slam bronze medallist NOUCHI Aimi (JPN) by ippon in the penultimate contest on day one. 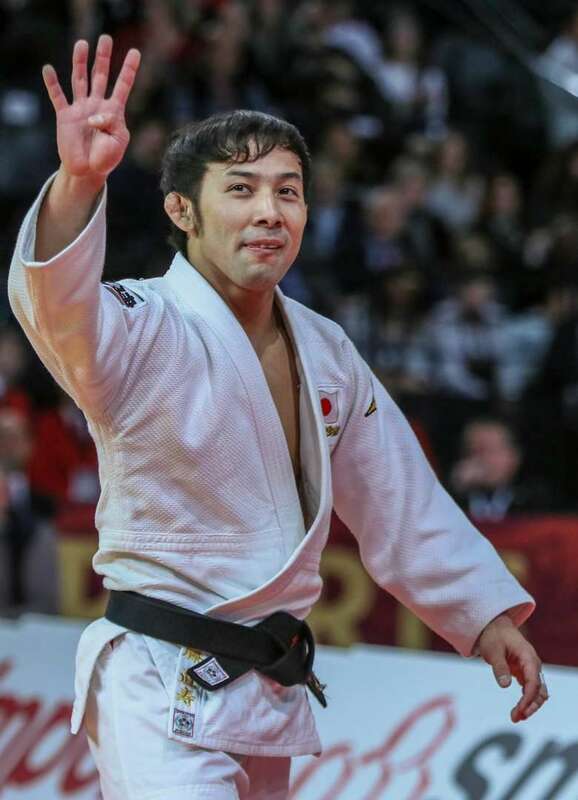 Three-time and reigning world champion TAKATO Naohisa (JPN) won the Paris Grand Slam for the fourth time as he maintained his 100% winning record over former world champion Yeldos SMETOV (KAZ). Japanese ace TAKATO, who has now won in Paris in 2013, 2015, 2017 and 2019, set a new record as his victory was his ninth on the Grand Slam stage. The Paris specialist countered a desperate attempt from SMETOV with te-waza with 13 seconds left on the clock for a waza-ari to live up to his red backpatch. 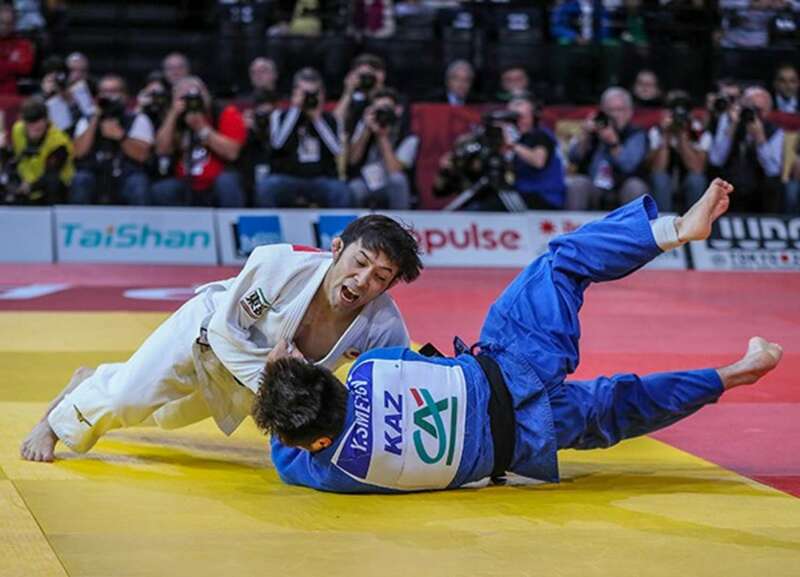 In the first semi-final TAKATO sent over Tbilisi Grand Prix bronze medallist Temur NOZADZE (GEO) with an uchi-mata for his second waza-ari score to move into the final. 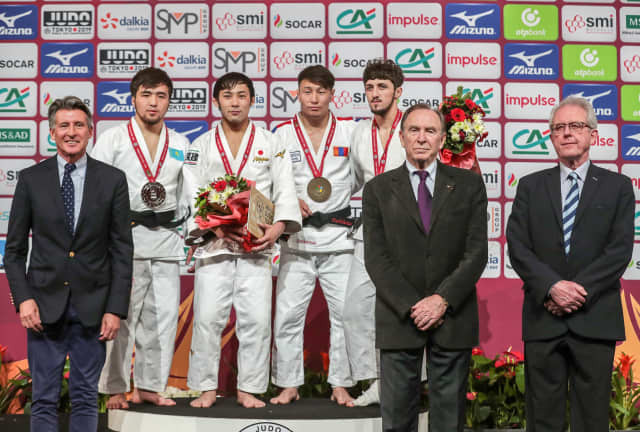 In the second semi-final World Judo Masters bronze medallist DASHDAVAA Amartuvshin (MGL) was thrown for ippon by SMETOV via a seoi-otoshi with 37 seconds left on the clock. 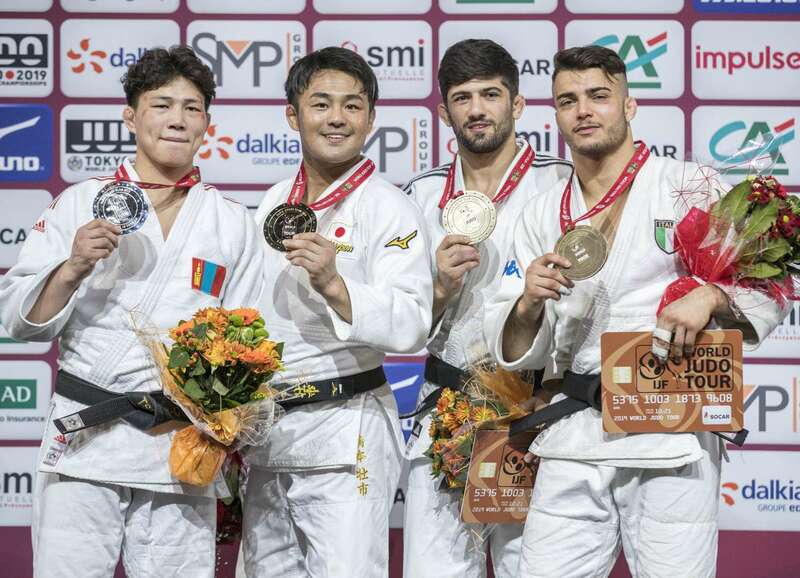 The first bronze medal contest was won by DASHDAVAA who used his experience to lure Tel Aviv Grand Prix silver medallist Tornike TSJAKADOEA (NED) into picking up three penalties and therefore the Mongolian star won after his Dutch opponent was disqualified. 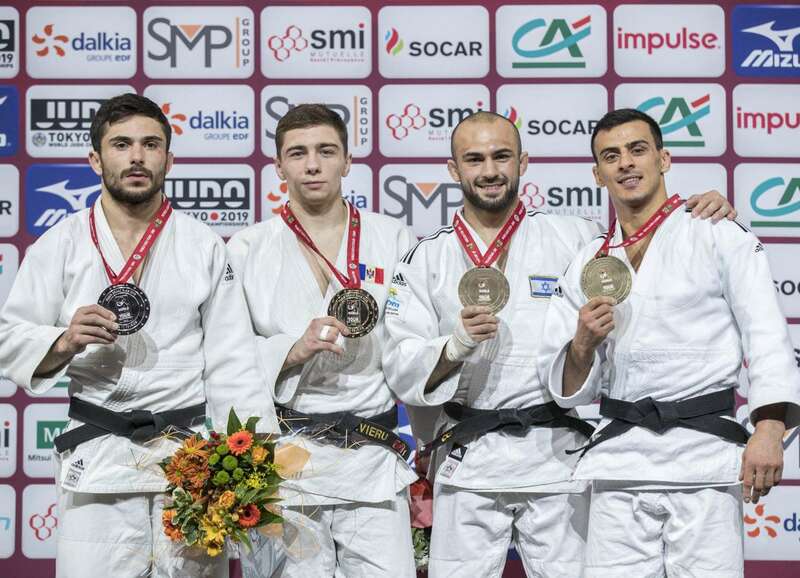 The second bronze medal contest saw NOZADZE defeat world number 61 Daniel BEN DAVID (ISR) by a waza-ari score to cap a memorable Grand Slam debut for the 21-year-old Georgian. Budapest Grand Prix bronze medallist Denis VIERU (MDA) won his first Grand Slam final to record his country’s first win at a Grand Slam. 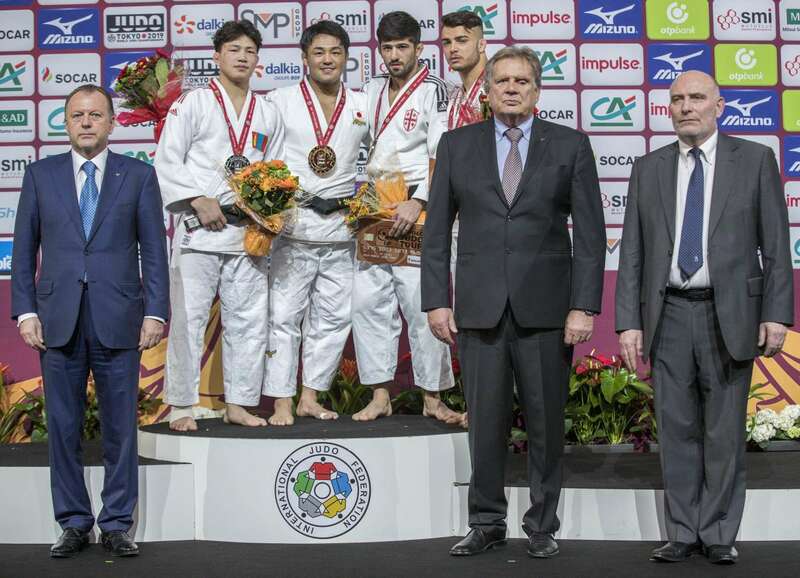 VIERU was tipped to play second fiddle to former world bronze medallist Vazha MARGVELASHVILI (GEO) but the former upstaged his Georgian rival and one-time Grand Slam winner with a majestic tai-otoshi earning ippon in the -66kg final. In the first semi-final VIERU edged past world bronze medallist Georgii ZANTARAIA (UKR) by a waza-ari after 70 seconds of added time while in the second semi-final former world bronze medallist Vazha MARGVELASHVILI (GEO) beat World Judo Masters silver medallist Baruch SHMAILOV (ISR) by ippon 25 seconds into golden score. In the first bronze medal contest SHMAILOV bested youngster Manuel LOMBARDO (ITA) with a front uchi-mata for a beautiful ippon. The second bronze medal went to ZANTARAIA who narrowly defeated Ekaterinburg Grand Slam bronze medallist Abdula ABDULZHALILOV (RUS) by a waza-ari score. 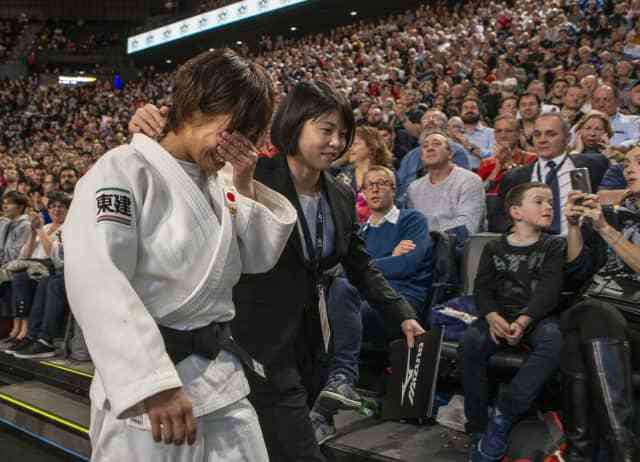 World champion ABE Hifumi (JPN) was sensationally stunned by Tel Aviv Grand Prix winner and Junior World Championships gold medallist Manuel LOMBARDO (ITA) in his opening contest. The 20-year-old Italian scored twice without reply to convincingly defeat the 2017 Paris Grand Slam champion and to send shockwaves across Italy and Japan. 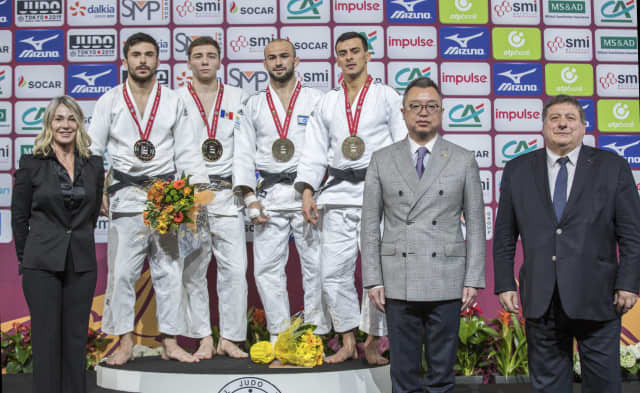 Former world champion HASHIMOTO Soichi (JPN) was back among the winners on the IJF World Judo Tour for the first time since 2017 as he showed his character to grind out a hard-fought win in France. 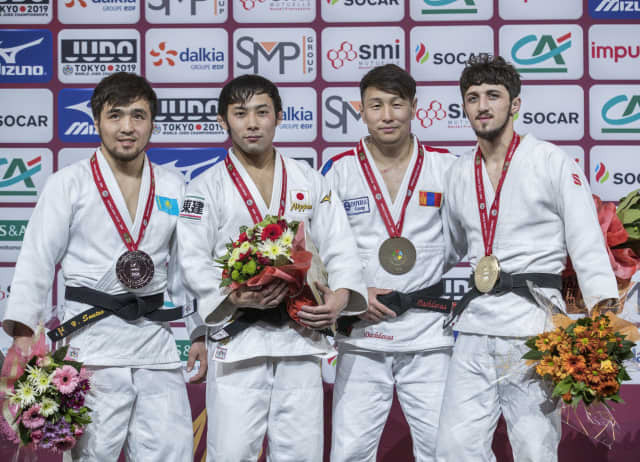 The Ippon Hunter registered a much-needed gold medal by beating Hohhot Grand Prix bronze medallist TSEND-OCHIR Tsogtbaatar (MGL) in the -73kg final. 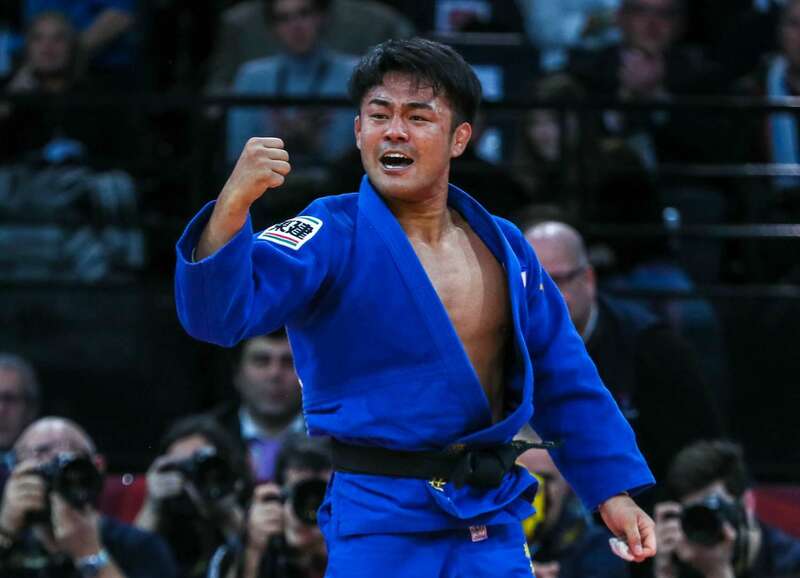 World silver medallist HASHIMOTO, who failed to hit top spot in his three IJF outings in 2018, threw the former -60kg competitor TSEND-OCHIR with a right-sided seoi-otoshi for ippon with 12 seconds left and the relieved Japanese star punched the air with delight and pointed to the immense crowd who applauded the Tokyo 2020 contender. In the first semi-final TSEND-OCHIR beat defending champion Akil GJAKOVA (KOS) by ippon. In the second semi-final HASHIMOTO defeated world bronze medallist Hidayat HEYDAROV (AZE) by two scores to power into the final. The first bronze medal was won by London 2012 Olympic champion and Rio 2016 Olympic bronze medallist Lasha SHAVDATUASHVILI (GEO) as HEYDAROV could not compete due to an injury sustained in the previous round. The second and last male bronze medal contest saw Olympic champion Fabio BASILE (ITA) surpass GJAKOVA with a modified kata-guruma for ippon.